Real Estate in Pejibaye, Costa Rica: The Ecologically Aware Environment. Named after the peach palm fruit, the town of Pejibaye is located in Jimenez, Cartago. It includes various neighborhoods, such as El Humo, Plaza Vieja, San Joaquín, Los Tigres, Oriente, El Oso, La Veinte, and Veinte Seis. Pejibaye is found in a valley between the Tapanti National Park, also known as Orosi Valley, and the La Marta Wildlife Refuge. Pejibaye is one of Costa Rica’s eco-minded communities. Another main attraction is the perfect weather. Since it sits at an altitude of 2,170 feet, it rarely gets hotter than 75 degrees Fahrenheit. In fact, some of the homes have fireplaces for the cool nights. The overall vibe of this town is one of a retreat or a getaway. It’s near enough to the city to be close to amenities, without suffering from any pollution or noise. It’s a relaxing place to work, raise a family, or retire. Pejibaye homes are all about style. While some are made with high end materials and finished with granite countertops and stainless steel appliances, most are more simple, but no less stunning! Even the smallest wooden cabin in the town is complete with a pretty porch. One of the most unique features of this town is that there are a lot of chalet style homes with gorgeous fences surrounding them. If you long for a white picket fence (or a hand crafted black iron one) it will be easy to find in Pejibaye. Home prices range from $75,000 to $150,000. Vacation rentals in the area start at about $50 a night for double occupancy. There are a number of private cabins for rent. The roads are well maintained, so it’s a nice ride to get there. Investment options in the area include hotels and restaurants, some with pristine river or waterfall views. 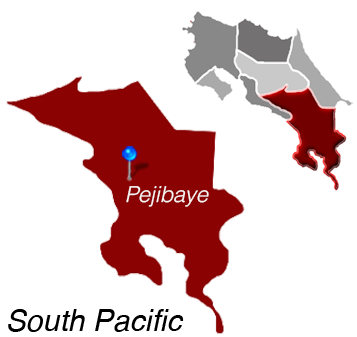 Pejibaye is Located in the South Pacific.